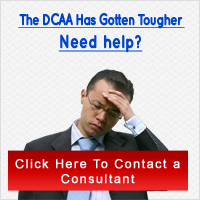 QuickBooks can easily become DCAA compliant. All you need is third-party to program the software to meet the standards set forth by the Defense Contract Auditing Agency. Having your QuickBooks DCAA compliant will prove helpful through the contract journey and the internal manual will help guide you through your endeavors as a government contractor. A third-party programmer can prepare your system to standardize and adequately document actions on daily, monthly, or annual bases. Regardless of the type of contract, your company must be able to tackle the needs of that contract type. If you are providing fixed-price contract than you will need to ensure that your QuickBooks can determine progress payments; for â€œcostsâ€ contracts your Quicken will need to accumulate costs, and for companies that use QuickBooks for newly approved contracts will need to be designed to estimate future costs. Once you decide to bid on a contract and know whether it is fixed-price, â€œcostsâ€ contracts, or if you are a new contractor you will be able to determine what criteria your QuickBooks will need to meet. If you are diligent and put in the necessary effort, you may find that your QuickBooks can be adapted for all contract types.